On a recent trip to the blustery coast of Cornwall, I explored one of, what I believe should be, our national treasures. 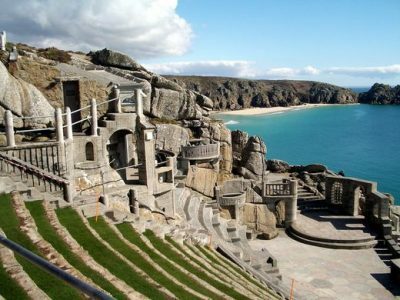 The stunning Minack Theatre, perched high on the cliff-edge overlooking the gorgeous Porthcurno Bay. Whilst the Minack Theatre is well-renowned amongst theatre-buffs, I didn’t know much about it’s history. It seems there are many sights we overlook within our own country! The view is, obviously, breathtaking (even on a rather grey day). 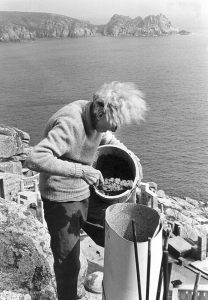 But, perhaps even more special, is the fact that the Minack is the realisation of one woman’s dream, and a lifetime of hard physical labour. Whilst recent global celebrations brought to light, and brought to life, the very many achievements of women around the world, for a belated nod to International Women’s Day, I’d like to remember and praise the work of perhaps a lesser-known wonder woman. The story began in 1929, when after a local production of A Midsummer Night’s Dream, Rowena decided the cliffs below her garden, would make the perfect setting to provide a future theatre space for local performers. 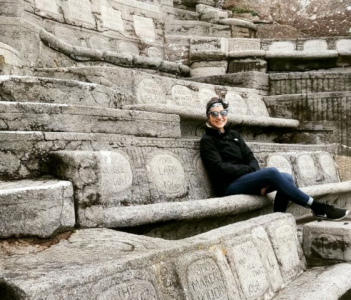 In 1931, with the help of her then gardener, Billy Rawlings, Rowena began the unenviable task of excavating tonnes of earth, and moving granite boulders to create the terraced theatre. Today, the lower terraces remain as they were. 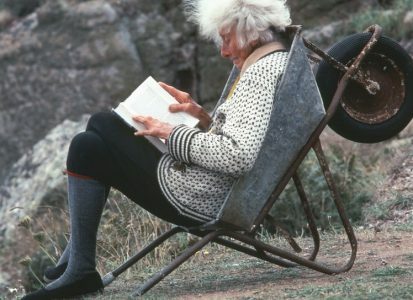 Rowena worked on the construction of the Minack throughout her life, and up until her eighties she could still be seen lugging driftwood and sand up from the beach below. Whilst Rowena recruited the help of a few other hands to help bring her ideas to life, she retained the title of “Master Builder”, and dreamt up innovative building techniques to overcome the barriers of cost and material availability. Many of her innovations can still be seen in the theatre today, including the pillars which line the steps. When Rowena could not afford to purchase stones, she determined that instead, she could construct with cement. But that didn’t mean it had to remain looking like cement. A feature that I particularly admired in the theatre was the decoration of almost every paving slab, and every stone seat. The seat backs were inscribed with the names of plays performed, along with the year, allowing a fascinating look back through the chronology of performances. Walkways and steps are decorated with carved shells, compasses, waves…all lovingly chiselled by Rowena herself, who used a screwdriver to carve out designs whilst the cement was still setting. The Minack Theatre is now a charitable trust, run and managed by a committed group of steadfast volunteers. It is still a working theatre, and we caught glimpses of a rehearsal of “The Secret Garden” as we clambered around the curved rows of seats. For a full history of the theatre, including how it fared during the Second World War, head over to the website. Better still, take a road-trip and explore it in person! By pursuing this dream, and following through despite the many obstacles that faced her, Rowena Cade has ensured that the joy of theatre has been brought to this corner of Cornwall. And not only is the Minack enjoyed by the locals; players and audiences alike travel for miles to tread the boards, and delight in theatrical performances. With ongoing construction and conservation, Rowena’s legacy lives on, her work is continued, and her dream fulfilled. Isn’t that something worth celebrating?